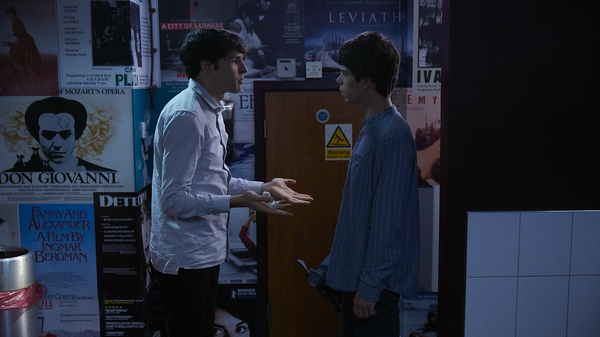 Benjamin (Colin Morgan) is an awkward and insecure young man, desperate for approval but a minor disaster when it comes to the world of romance. His new film ‘No Self’ – an autobiographical picture about love and disconnection – is premiering at the London Film Festival, and he’s more than a bit keen for the acclaim of the merciless audiences. As the nerves and anxiety surge, his publicist introduces him to an attractive French musician called Noah (Phénix Brossard) – a meeting that hurls him into an existential crisis. Incredibly human and remarkably endearing, this is a film that comes from a place of honesty – Simon Amstell’s own toe-curling experiences of love shine loudly, hilariously straddling the line between reality and the ridiculous. Simon Amstell on Benjamin: "The feelings are real"
View Simon Amstell on Benjamin: "The feelings are real"